At 9,000 feet, The Lodge Golf Course beckons you with mountain bluegrass fairways, bent grass greens and 80º summer temperatures. Governed by the Scottish tradition of playing different tees and separate flags on each hole, this 9-hole course, when played twice, becomes a challenging 18-hole round. The Lodge also offers first-class accommodations. Public Course—18 Holes. Open Apr. 1–Oct. 31, seven (7) days a week. Tee times are recommended. Facility/Services: Putting Green, Practice Net, Snack Bar, Restaurant, Bar, Golf Shop, Carts, Club Rental, Tournament Services, and First Class Accommodations. Fees: Range from $25.00 to $36.00; carts $14.00. 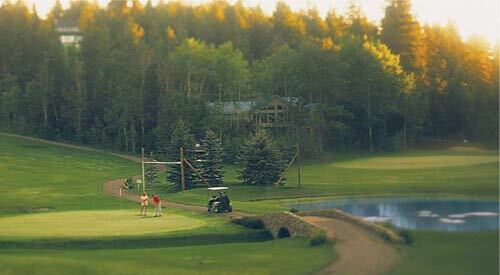 Seniors, groups, military and twilight golf rates are available; please call for details. Credit Cards Accepted: VISA, MC, Amex, and Discover. Getting There: Turn east off Highway 54-70, 2 miles north of Alamogordo onto Highway 82. travel 16 miles into Cloudcroft, turn south (right) at the Allsups, then continue for 3 blocks to the top of the mountain.